AdminProject has been designed to make your life easier! Working with European Project for over 10 years made us thinking what could be done to simplify our day to day operations. Together with other Project Managers we created a set of modules that have changed our lives for good. 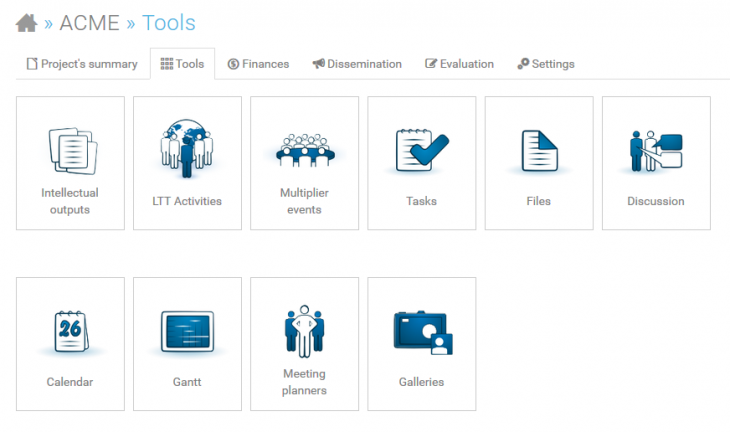 Now we cannot imagine working without AdminProject, so see how it can help you as well! Tasks module is the very core of management. 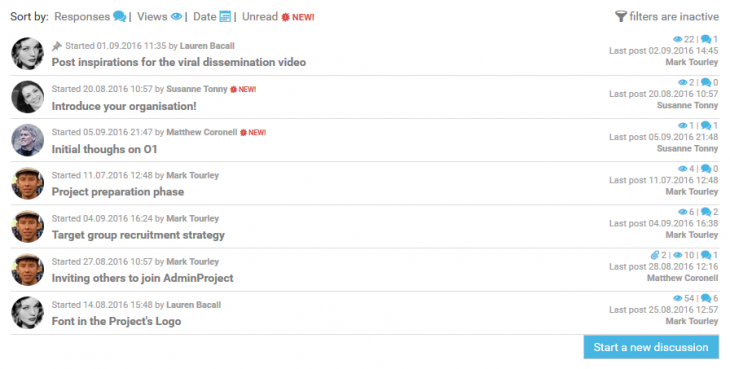 Every user in the project can assign a task to another person – or to a group of them. You can define deadline, link files, select to which WP or IO the task belongs to. Tasks management comes with unique feedback mechanism, which allows to track progress and control quality of work being done. Discussion module allows you to freely discuss everything and anything within your project. Invite your project collaborators to voice out their opinions, and discuss all important aspects with the rest of your team. The most important topics can be pinned, so that they will always appear at the top of all the other discussion threads. Unread messages are highlighted, so you immediately know in which topis there are new replies since your last visit! Files module is a centralised file storage area, absolutely essential for any project manager. You can create unlimited amount of folders, to keep your data organised. There is a versioning mechanism behind the scenes, so you have access to previous version of the files as well. You can filter and search for files, using several criteria. 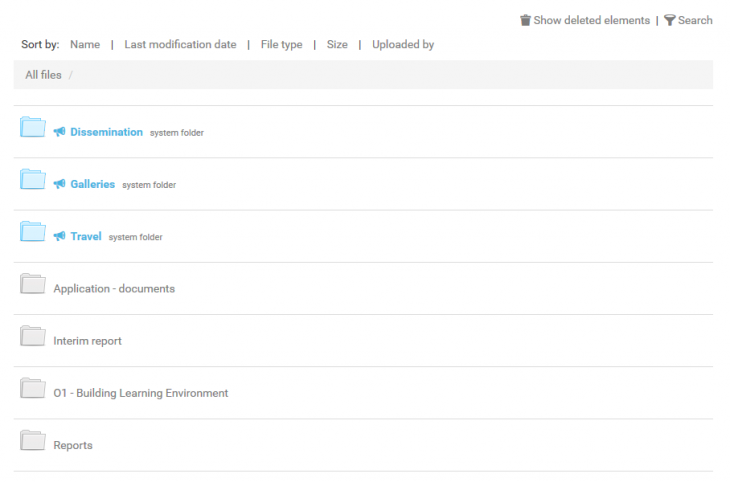 Unique feature allows you to link already uploaded files to other modules. To keep all your data in one place, there is even a gallery module. All files are protected, and you can even safely undelete lost files. E-mail integration module allows you to accomplish several tasks using only your email, also from mobile phone, tablet or whatever other device you are using. You can add comment or take part in a discussion simply by replying to the e-mail. You can receive your tasks via email and you can even upload a file by sending it as attachment. However, if you don’t like it, you can switch it off at any time. Dissemination module is another unique feature, favoured by many users. 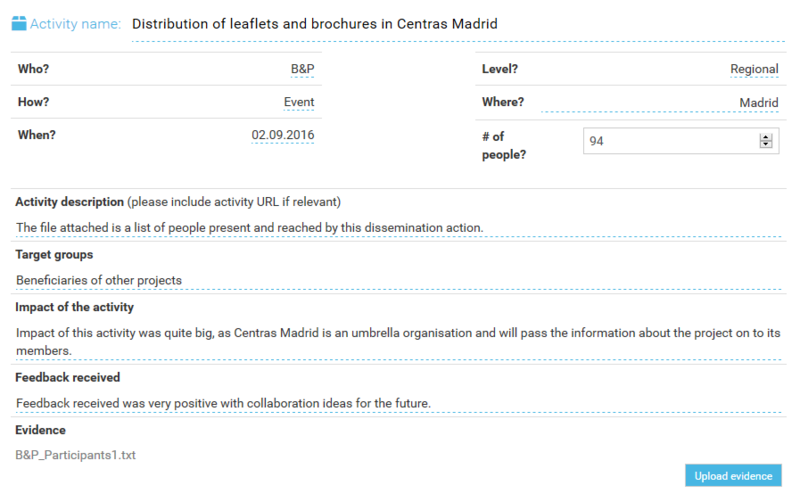 It allows you to report your dissemination actions, add proofs (like photos or scans) and describe what was done. As coordinator, you can track progress of entire partnership. Any time you can generate report, which will contain all actions per partner, presented in one Word file. From now on, you do not need to gather dissemination activities and proofs in Excel files or anything like that. You are just one click away of getting all this organised. Dissemination report – done! Timesheets module is yet another feature, not found in (probably) any other project management system. As coordinator, you need to define project partners and their daily rates, and ask people to fill in their own timesheets. When reporting time comes, you can simply hit a green button to get a nice report. As a bonus, if you have more than one project in the system, you can automatically check if you did not put by mistake the same date in two or more projects. To have all your project activities and responsibilities in one place, you can use tools like Intellectual Outputs or Work Packages (depending on your project type), where you can fill in all the details, e.g. activities, languages and so on. 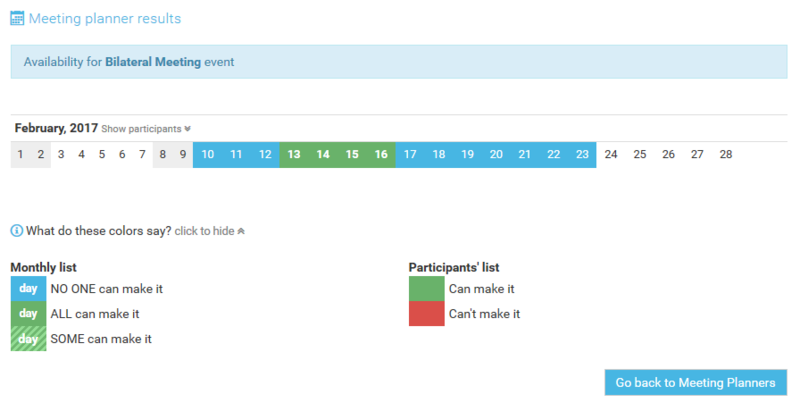 There are also places to fill in your LTT Activities and Multiplier events. Basically, AdminProject takes advantage of all information you put in. By providing list of Intellectual Outputs for example, you have the possibility to link specific tasks to given IOs. As simple as that! Calendar and Gantt modules – pretty self-explanatory parts, but interesting part is – the dates are extracted automatically from IOs you defined, so there is nothing for you to do extra, just nice, zoomable chart. Calendar gives you also possibility to add various events, milestones or deadlines for deliverables. As a bonus, you can overlay calendars from several projects you manage, so any conflicts will be visible immediately. Meeting planners – as name suggests, this is simple module where people can fill-in their availability for various events. All you need to do is to provide dates suitable for you, and then ask your project team members to mark their availability within specific range of days. One quick view on the results and you immediately know which dates are suitable. To wrap up – just a few clicks and you’re done! Evaluation module is helpful in every project. This module allows you to create surveys, with several types of questions and then invite your users to fill it in (both internal and external). Repetitive surveys, e.g. meeting evaluation questionnaires can be easily duplicated and adopted, without filling in everything. All in one place! AdminProject workspace can be heavily customised. 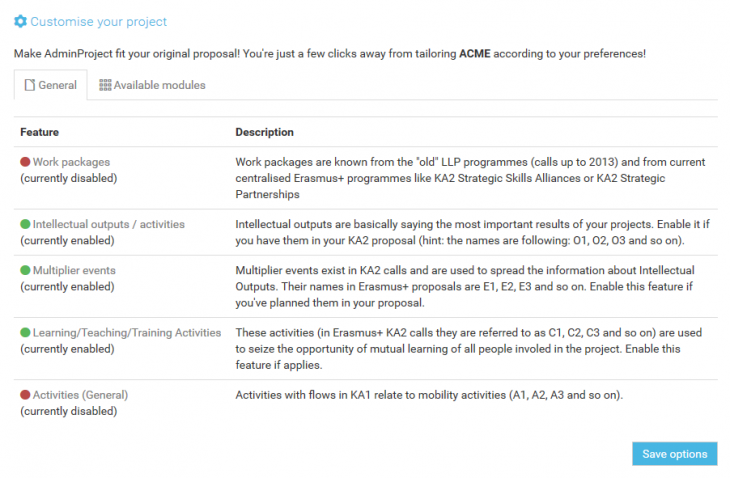 If you have Erasmus+ KA2 project – you will need Intellectual Outputs, but you can also have project with Work Packages. You can have LTTAs and Multiplier events – it is all up to you. We are aware, that every single project is different, so you might want to adjust specific modules/functions that are needed by your project. It’s not a one-time deal, you can turn functions on and off anytime you want! Let AdminProject adjust to your needs and requirements, not the other way around! Stay reassured – we’re here to help! Our policy is to listen what our users are saying, as the best way is to deliver features in response to real-life needs. If you have any thoughts/issues/suggestions, we are here to help. Let us build a complete environment for managing European Projects together.